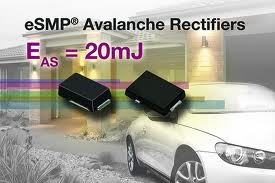 Vishay announces their new family of Surface Mount Fast Avalanche Rectifiers. These are targeted for use in fast switching rectification of power supply, inverters, converters, and freewheeling diodes for consumer, automotive, and telecommunication. The family consists of nine series of diode in three speed categories and two package types. In the SMP package, with a low profile 1.0 mm height for space constrained designs, Vishay offers standard (AS1Px), fast (ARP1x) and ultra-fast (AU1Px). Similarly in the SMPC package, there are the standard (AS3Px and AS4Px), fast (AR3Px and AR4Px) and ultrafast (AU2Px and AU3Px) version. For convenience in the part numbering scheme, the second letter refers to the recovery speed category – S (standard), R (fast), and U (ultrafast). Datasheets and ordering information available at Vishay . Priced at $0.09 to $0.15 depending on quantity.